There are various ways of balancing your chakras with Reiki. Today I will share with you 5 ways in which you can balance your chakras with Reiki. You can use the technique that suits you the most or depending on the time available with you. Chakra is the Sanskrit word which means wheel and this wheel of energy can also be felt. Many times when Reiki practitioners are doing healing they can feel the hand Chakras moving in a certain direction, clockwise or anticlockwise. Sometimes when we healing somebody, the person will tell you that the crown Chakra is moving in a certain direction or the root chakra is moving. It happens even during Reiki attunement to some people. Secondly, the Chakra sends energy in all directions to all the organs and glands nearby. Chakras are energy centres in the body. The universal energy of Reiki enter the body through the Sahasrara Chakra and then passes through Vishuddhi Chakra, Anahat Chakra, Manipur Chakra, Swadhisthana Chakra and Moolaadhar Chakra and then passes into the Earth. While passing through each of the Chakras the Reiki energy energizers all the surrounding glands and organs in the body. If there is any lack of energy in any of the Chakras the Reiki energy charges that chakra and brings it into balance. What creates energy imbalance in the body? Imbalance can be created by stress or it can be caused by worrying too much or by some kind of irrational fear or even a real fear. Sometimes our energy can be depleted by being in the company of people who have low or negative energy. One of the reason we should to our Reiki practice frequently is to be in a positive state of mind most of the time. Your state of mind tells you that your chakras are in a balanced state or not. The moment you have negative thought or emotions of fear, insecurity, et cetera then you can notice that the energy level of the body goes down. If it stays low, it can make the person sick. You can keep your chakras in balance by just reciting the Reiki principles a couple of times a day. 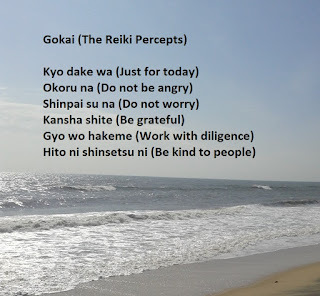 The moment I wake up in the morning I invoke the energy of Reiki and recite the Reiki principles "Just for today I will not be angry, I will not worry, I will be grateful for everything, be kind to everyone and I will do my work honestly." Many of my students who do the same say that they feel much better during the day when they spend the first few moments of the day in resiting the Reiki principles. This is a simplest way of chakras balancing and keeping them balance of the day. The second way of balancing a chakras is by healing all the seven chakras with hands. In this you keep your hands on each of the seven chakras and give Reiki to each of the Chakras till the time they get fully charged. You must keep your hands in each of the 7 hand positions as long as you feel the flow of the Reiki. Once the Chakra is charged, it automatically stop and that's where you move on to the next Chakra. The Third way of balancing a Chakra is by asking another Reiki practitioner to heal your 7 Chakras by hands on healing. This is often recommended when you are under severe stress. When you are not in a position to heal yourself it is better to approach a Reiki master or a Reiki practitioner who can do a seven chakra healing for you. It will cost you a little bit but a 1 hour healing can go a long way in helping you deal with any stressful situation at home or at work. Sometimes people go through a stressful phase in life. In such a time it is very important to heal yourself because if your body is in a stretched state for a long time then it can cause digestive problems, aches and pains, and relationship or performance issues as well. The fourth way of charging and chakras is by crystals. One of the simple technique is it keep the 7 chakra crystal set below your bedsheet. There are various ways by which you can do powerful chakra healing with crystals and you can learn these amazing techniques in the Crystal healing workshop. Check out the course schedule or whatsapp me. The fifth way of balancing a Chakras is by chanting the Mantra of each of the Chakras. You have to be in a peaceful state of mind each Mantra slowly in your mind. Mantra has its particular vibrations that open up the Chakra and remove any blockage or stress. The sixth way to balance chakras. If you have considerable practice in Reiki then even with your intention the all your chakras can get balanced. You need to do is invoke Reiki and have that in tension and everything will be done automatically. The 7th way of charging the chakras is by visualizing the color of the Chakra in a meditative state. Find the details of the characteristics of each of the seven chakras in this article. How much time do you need to charge your Chakras? To be consistent in your practice of Reiki. Some days if you have less time you can do chakra healing in 10 minutes. And sometimes we have more time you can take as long as 30 to 40 minutes. One of the best time to do chakra healing is the moment you wake up. My students take just 5 minutes to do a quick Reiki bath as soon as they wake up. Here we are just letting the Reiki energy flow through all the chakras and let the intellegent energy of Reiki charge all the Chakras automatically. After refreshing yourself we can do a proper 7 chakra healing by keeping our hands on each of the Chakras. This can be done anytime during the day as well. The last chance for doing chakra healing is at night before going to sleep. If you could not find time to do Reiki during the day then you must do your chakra healing before you go to sleep at night. If you fall asleep midway while doing a chakra healing it's fine. The moment you wake up you can continue from the Chakra where you left at night and finish it. Chakra healing will keep your chakras charged and help you enjoy good health. When your chakras are in balance you will feel good, relaxed and happy and when they are unbalanced you'll feel tired, depressed and unhappy. During the day if you are in positive state of mind most of the time, you will experience vitality. When you are not in a positive state of mind immediately do a 5 to 7 minute chakra healing amd balance yourself so that you can bring back the balance state of mind where you feeling good, relax and happy. You have to be always aware of your state of mind so that you can be in a emotionally positive state. Our mind, body and emotions are connected. If we are stressed mentally, we will have negative emotions and we will feel tired. Chakra healing releases stress and you will then have positive feelings and your body will be full of energy and vitality. If I am feeling any lack of energy anytime immediately you must do a 7 chakra healing and balance and energize yourself. If you have to do this two or three times a day, just do it. This is the only body you have so take care of it. Our body can tells us what we need to do. We just need to listen to it. If you are busy, do it daily & more often! 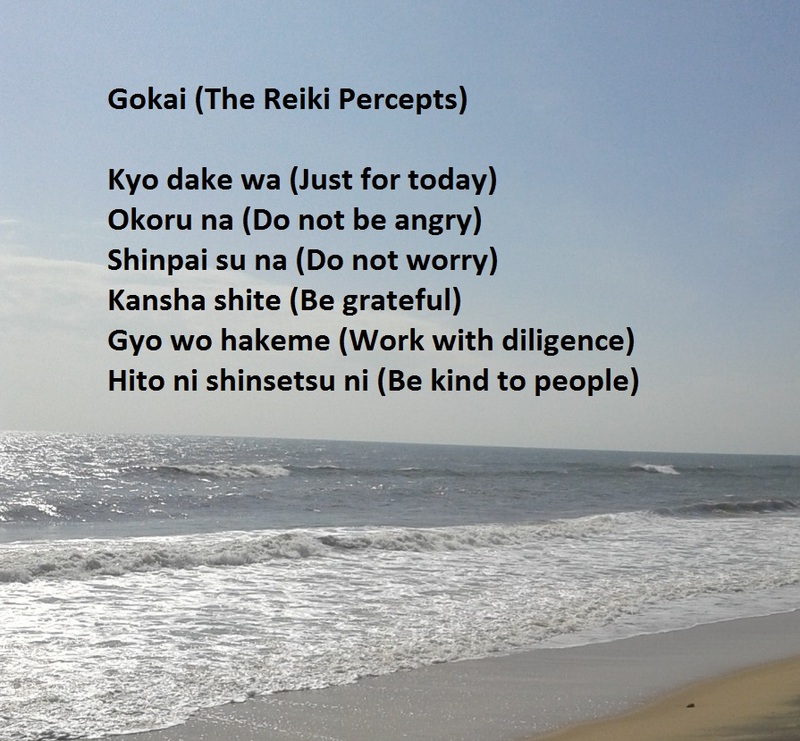 Sometimes people say that I am so busy I did not get time to do Reiki. This should be a warning sign because if you are very busy then you will have lot more stress than normal and very quickly you will be drained out. You will not be able to function properly mentally and emotionally, there can be lot of problems in life. So if you are busy then you must do your Reiki healing everyday. If you are mentally an emotionally balanced you can make lot more money then if you are not in balance. Don't be so busy in making money that you lose your balance. Choose a job, business or profession that allows you to have balance in life and enjoy each day. Be grateful for the gifts that nature has given us and do not worry too much about the past or the future. Just enjoy the present moment. When I do a seven chakra healing for someone I can easily identify the chakras which are blocked to a lesser or greater degree. I instantly come to know the problems a person may be having physically, mentally emotionally or in relationships even without asking anything to that person. Usually after a chakra healing session I recommend the student to focus on 1 or more chakras based on what I experience during chakra healing. Just by following the recommendations people have experience many changes in their life. Hope this has given you some new ideas for chakra healing and balancing. Please feel free to share your experience in comments below. 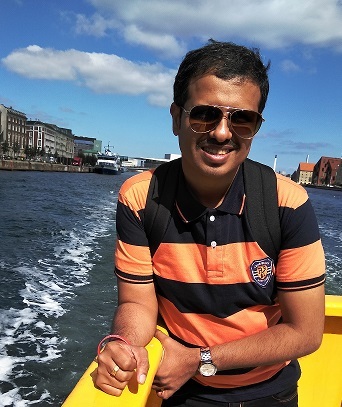 About the Author: Sachin Bangera holds a Masters degree in Psychology and he is a Reiki Grand Master based in Ahmedabad, Gujarat. He is originally from Mumbai. He travels frequently to Delhi, Mumbai, London and many other cities to spread the pure teachings of Sensai Mikao Usui, the founder of Reiki. 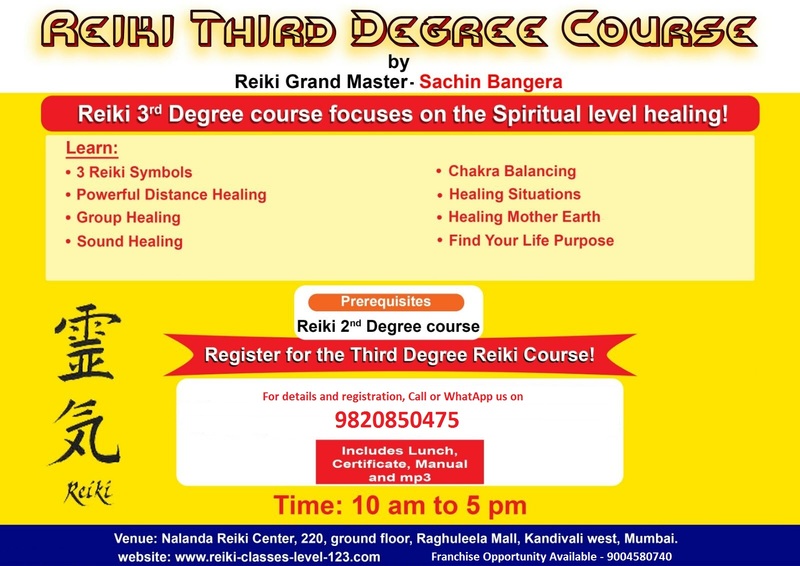 Sometime back I wrote about the preparation for Reiki third degree attunement and today I am going to share some of the benefits of Reiki third degree course. With the Reiki third degree the practitioner since the journey of continuous spiritual growth. With the opening of the higher Chakras the practitioner is now able to access the limitless potential of Reiki. In the third degree the practitioner develops the ability to heal almost all illnesses know to man. The Reiki practitioner experiences love, joy, peace, happiness, wisdom and abundance in all areas of life. With regular practice of the techniques of Reiki third degree the practitioner feels completely secured in all situations of life. 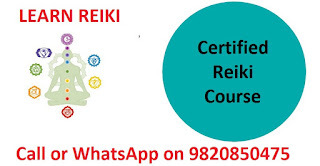 The Reiki practitioner gains an inner confidence that Reiki will do whatever is necessary to him pass through all of life situations effortlessly. The mysteries of the Universe become available to the Reiki practitioner through meditation. New opportunities for personal growth will present itself to you in various ways. Life situations will change and your life will become more meaningful, giving you more satisfaction, peace and joy. You will be able to manifest things in your life with greater amount of ease and grace. Your intuitive abilities will be heightened. 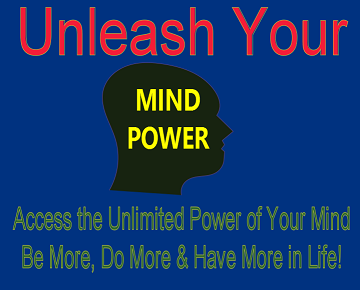 You will get deeper insights into any subject that you put your mind upon. You will get divine guidance to improve every aspect of a life. You will be more intuitive and more creative in conducting healing sessions. Your relationships will go to the next level and you will be able to connect to people easily and the right kind of people who will support you in your spiritual progress will enter your life. The universe will be aligned to your life purpose, of which you will have greater awareness and miracles in your life will be dime a dozen. With the practices of third degree of Reiki will enable you to be in a positive, healthy and happy state of mind, most of the time during the day. You will have greater awareness of the consciousness within from which you will operate your life and create your reality. You will be able to solve multiple problems with one solution. After Reiki 3rd degree attunement the Reiki practitioner is on the path to enlightenment. Each degree of Reiki comes to us only by the grace of God. And this is especially so for the third degree of Reiki. When we are developed enough from within, we are automatically guided to the next available third degree course of Reiki. 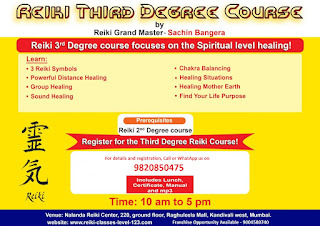 You will also have the opportunity to register in upcoming 3rd degree courses organized by Nalanda Reiki Center at Mumbai, Thane, Navi Mumbai, Ahmedabad, etc. Just will this form and join our Reiki community! These matters are of experiential nature so it is not enough to conceptually understand this. We have to go through the experience of attunement, exercises and practices of this degree to realize them. Reiki is unlimited. The truth is much bigger then us. It is impossible to comprehend it in its entirety. But after the third degree attunement of Reiki we get glimpses of the ultimate reality of the supreme truth. 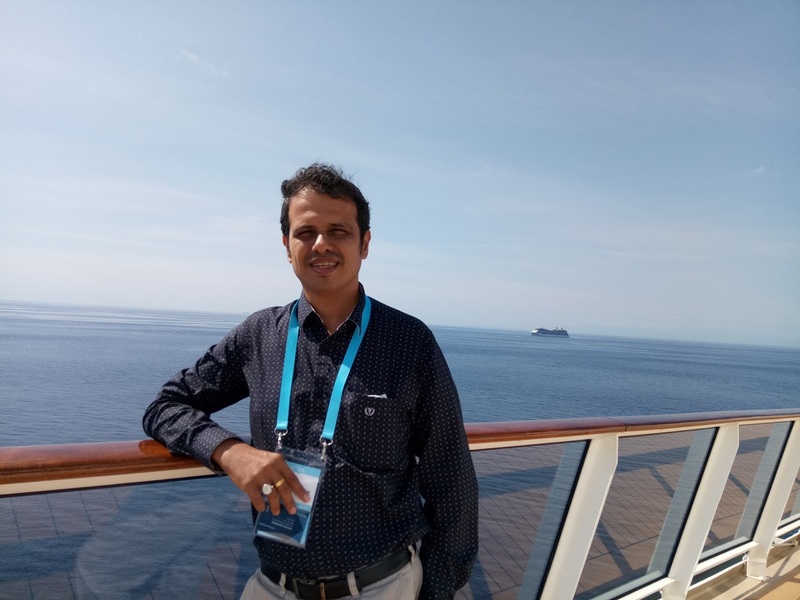 Sachin is a Reiki Grand Master and Life Coach. He conducts spiritual courses on weekends. He is the founder of Nalanda Reiki Center. 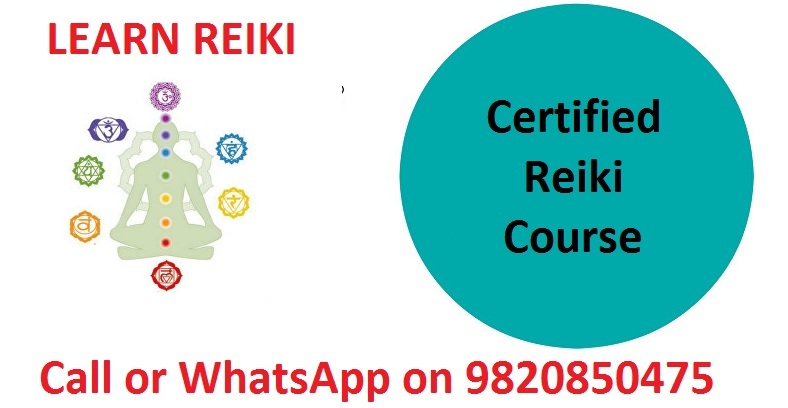 The purpose of Nalanda Reiki Center is to train Reiki Master and together spread Reiki all over India in cities like Delhi, Dubai, Ahmedabad, Thane, Navi Mumbai, Nashik, Kolhapur, Nagpur, etc.